Oakdale, CA is a charming community of 20,000 people. Oakdale’s location is 90 miles between beautiful Yosemite National Park and the Pacific Ocean; a great destination for your travels. Spend time visiting the quaint shops, museums, major grocery stores, and many choices for great food. 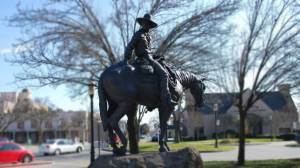 Oakdale is the Cowboy Capital of the World visit us and find out why. For additional information about Oakdale visit the City of Oakdale’s Website. Download the tourism brochure here. For more tourism information, visit Oakdale Tourism & Visitors Bureau. Formed in April 1917; initially the organization represented only a few businesses. Today it represents just under 330 businesses and 3200 employees. Our Board of Directors consists of diversified business people who serve Chamber members and associated committees. Unite the business community by enhancing business, economic growth and tourism; while retaining the high quality of life in Oakdale. Chamber Champions are taking the lead for creating a desirable environment for business in the Oakdale District. Thank you for your support. Download this packet to find out how your company can be listed as a Chamber Champion in 2018. 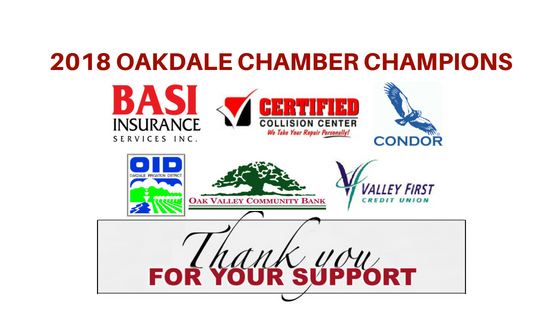 Most of our events offer a discount for Oakdale Chamber Members and an additional discount if you register by an early registration deadline. Scroll over the events listed on left sidebar for Oakdale Chamber of Commerce hosted events, like the Chocolate Festival, or click on our Event Calendar to see upcoming community event details.